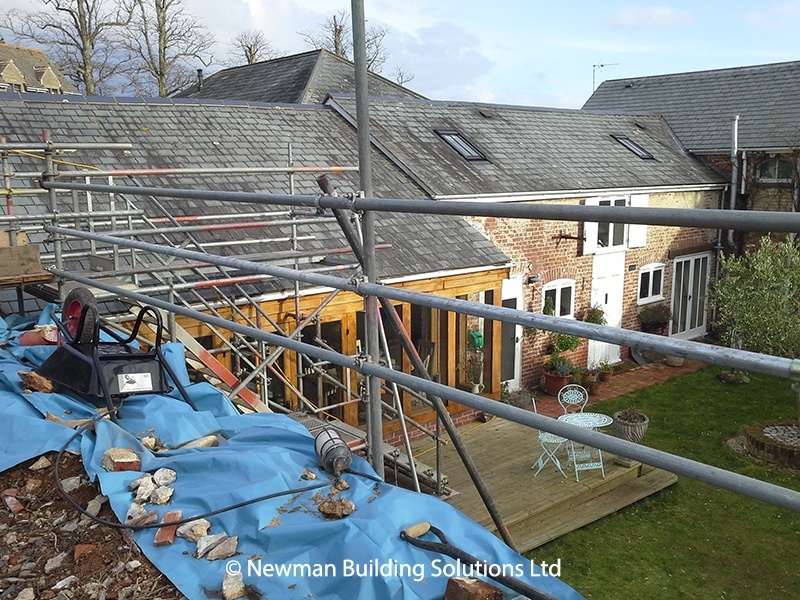 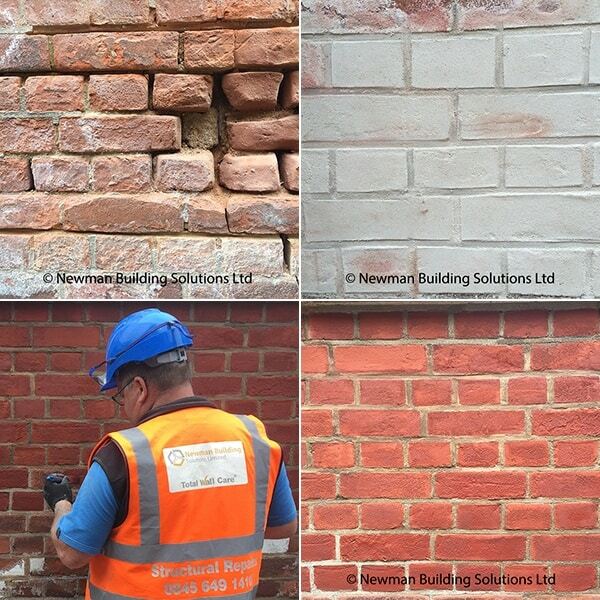 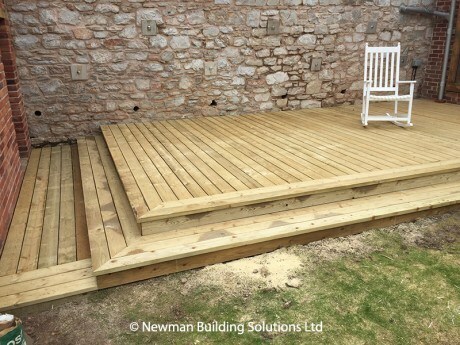 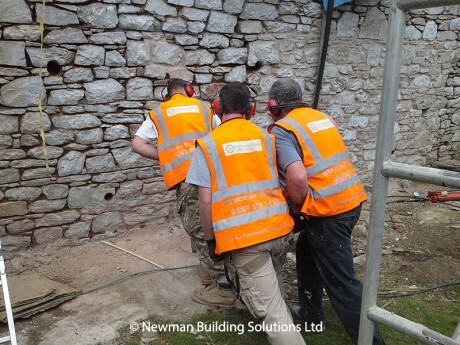 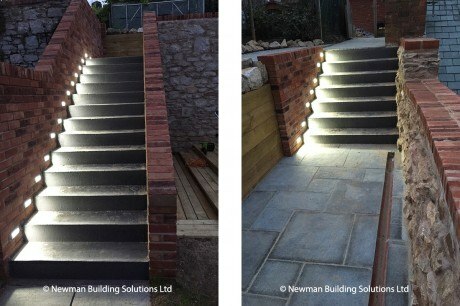 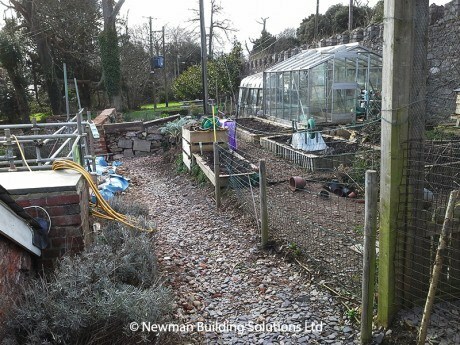 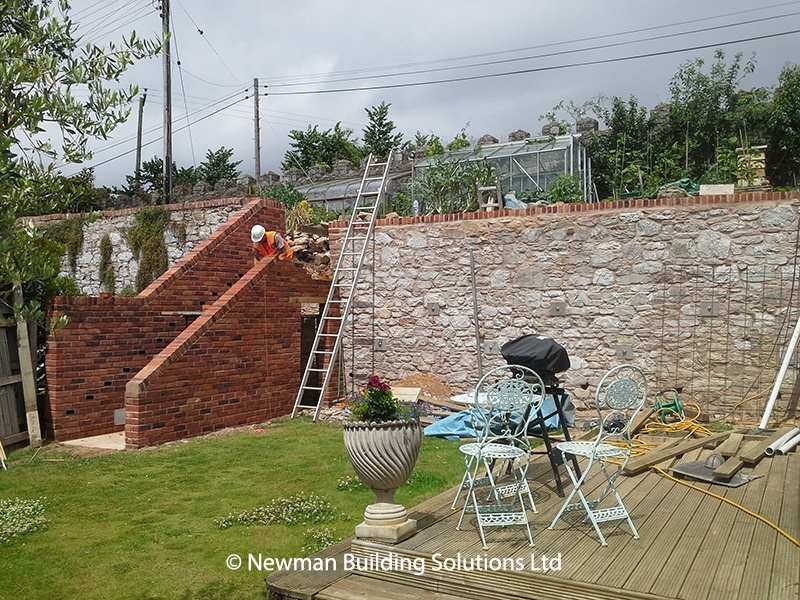 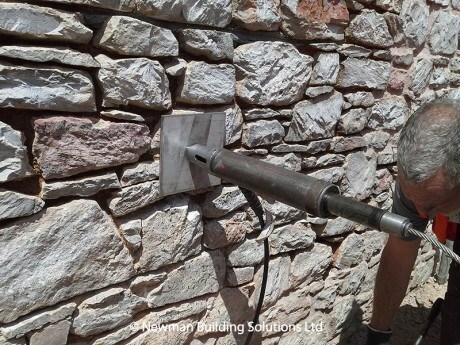 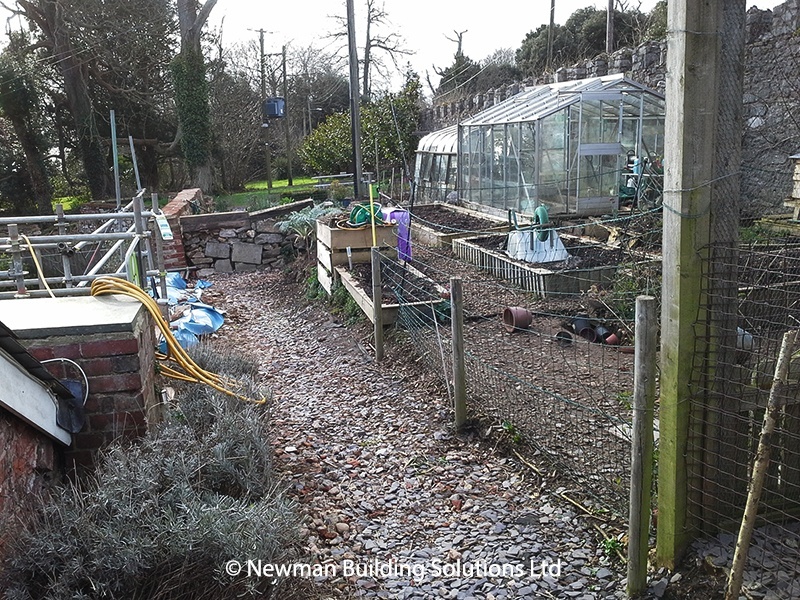 Newman Building Solutions were recently contracted by a Devon based surveyor to carry out a retaining wall stabilisation and to build a stairway at a property in Exmouth. 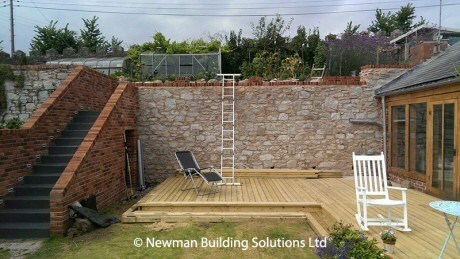 The Victorian wall, constructed in random stone, was 2.8m high on the lower garden side and less than half a metre high on the upper garden side, retaining a huge amount of earth and pressure. 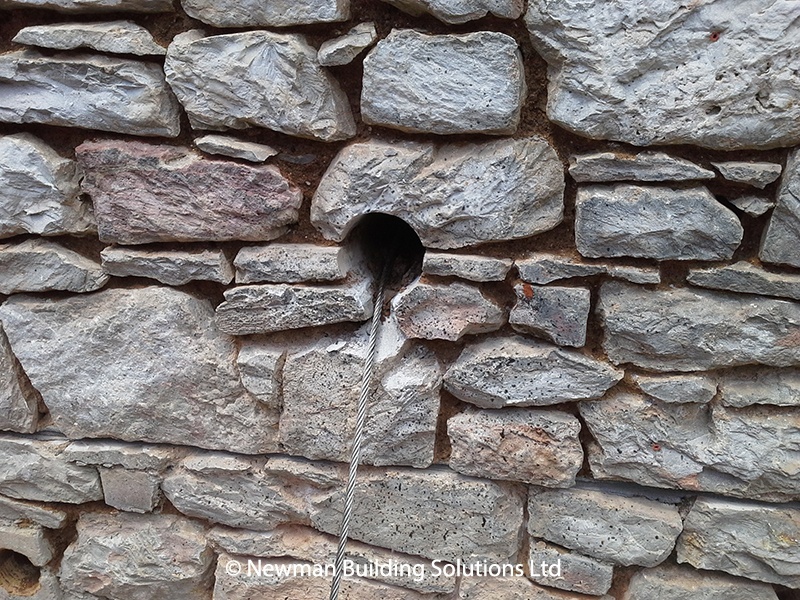 A rupture in a mains water pipe has saturated the clay soil causing the wall to move and bow. 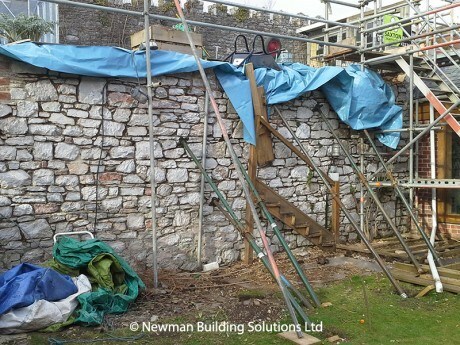 Prior to the Surveyor contacting us a number of other contractors had been approached and some makeshift props had been put in place. 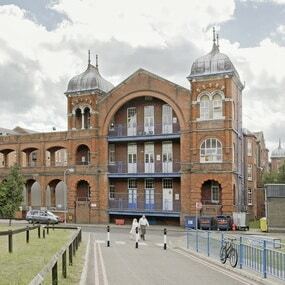 Their proposals all recommended the building of large brick buttresses. Following testing of the soil on the upper garden side Newman Building Solutions proposed the installation of Platipus Ground Anchors in conjunction with deep, bed-joint reinforcement to the wall itself. Each Platipus anchor is inserted in a horizontal position, through a hole in the wall, deep into the earth behind it. 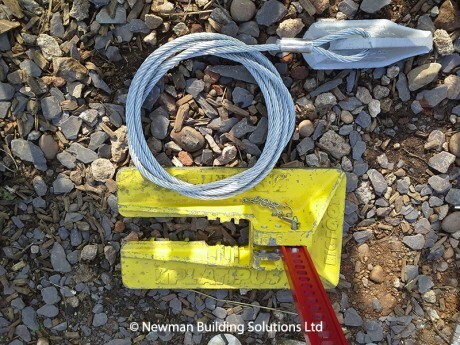 The attached, 12mm, stainless steel wire tendons are then pulled which causes the anchor to pivot to the horizontal. The wires are then tensioned, gripped and capped. 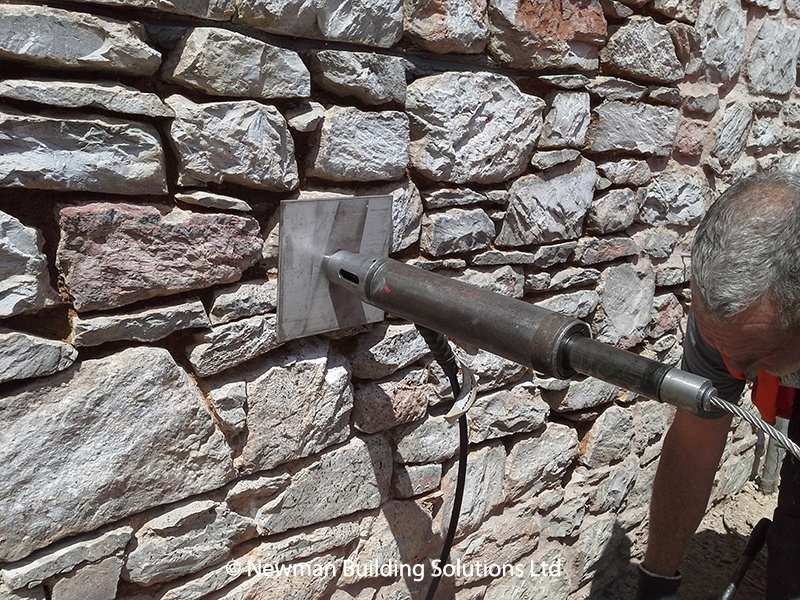 The wall was reinforced using Twistfix Heliforce stainless steel helical bar to create deep masonry beams. 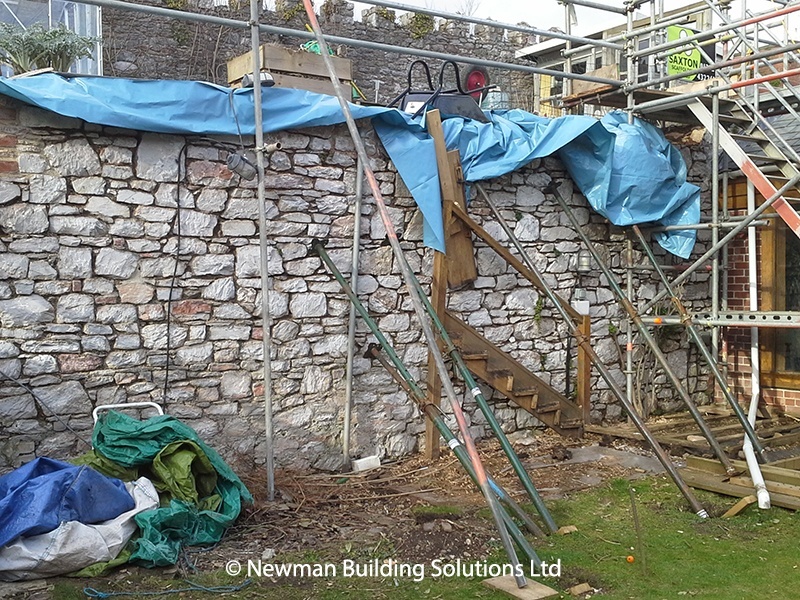 The entire wall was then repointed using lime mortar. 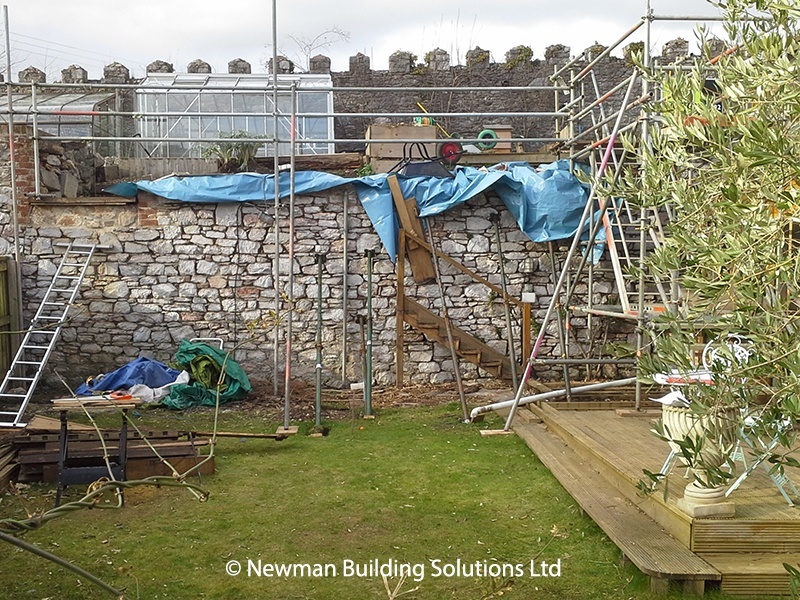 The original specification also included the building of stairway from the lower garden to the upper garden. 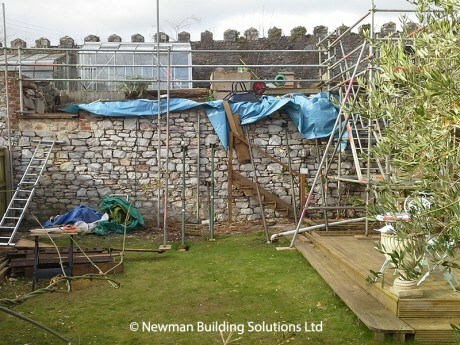 Although we are a structural repair company rather than general builders, our team are highly skilled tradesman and were easily able to complete the task. 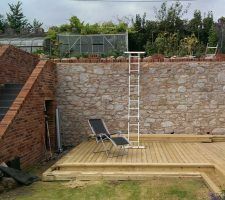 The client was so pleased with the work that we had carried out that he requested further improvements to the property. 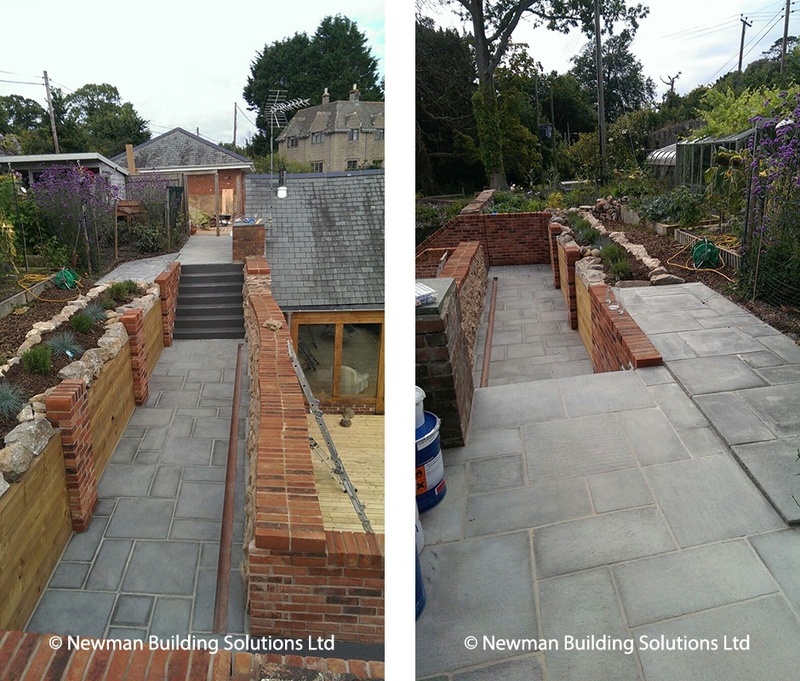 Our in-house team designed a sunken walkway in the upper garden with a new, dwarf retaining wall, an additional stairway, paving and a replacement, aluminium cast rainwater system. Both sets of concrete steps were then finished with the Vulkem Quick Balcony and Walkway system which is hard wearing, easy to clean and non-slip. The client was extremely happy with the final results and there’s not a single, unsightly buttress to be seen!